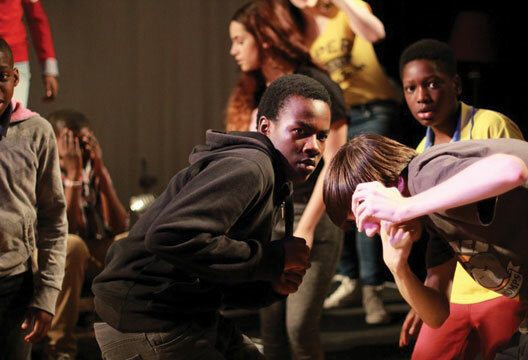 A young theatre group have created a play based on the development of the teenage brain, with the help of neuroscientists from University College London. Teenagers from the Islington Community Theatre (ICT) have been working alongside Professor Sarah-Jayne Blakemore over the last two years on their play, Brainstorm. The young people contacted Professor Blakemore after watching her TED talk, and she, together with her PhD student Kate Mills, helped them to develop their play and understand the science behind the developing teenage mind. They performed an early version of the play to family and friends around 18 months ago [see our review, tinyurl.com/lw9gjod) and a short version of the play at the Royal Albert Hall in spring 2014. The early versions of the piece used dance, song and monologue to portray the effects of changes in the brains of teenagers and explain the fact these can sometimes lead to feelings of loneliness, self-consciousness and recklessness. At the Royal Albert Hall performance Professor Blakemore joined the performers on stage to give a short lecture about the neuroscience of the teenage brain.